AVR-X2200W is rated 4.5 out of 5 by 2. Packed with the latest audio and video technologies, the AVR-X2200W delivers incredibly immersive surround sound, built on an extensive sound tuning and plenty of amp power. With Dolby Atmos, you’ll experience the same revolutionary 3D surround sound found in premium movie theaters. And, via a future firmware update, the AVR-X2200W will be able to decode DTS:X soundtracks, which also deliver an immersive 3-dimensional soundspace. The AVR-X2200W features an advanced video processing system which provides for 4K Ultra HD full rate, and it can upscale analog and digital SD and HD video to 4K UHD. The AVR-X2200W is also HDCP 2.2 compliant, a requirement for 4K Ultra HD copy-protected content. For many years, movie surround soundtracks have been channel-based. Revolutionary Dolby Atmos surround sound technology dispenses with channel-based coding in favour of more advanced object-based coding, giving the sound designer the ability to precisely place sounds anywhere in the 3-dimensional space. Now, you can enjoy this same award-winning technology at home with the AVR-X2200W, which features the ability to connect a 5.1 surround sound speaker system and 2 additional overhead speakers or 2 additional Dolby Atmos-certified up-firing speakers for the ultimate home theater experience. Along with Dolby Atmos decoding and Dolby Surround Upmixing, the AVR-X2200W also features Dolby TrueHD lossless decoding and other Dolby Digital technologies. Featuring an advanced quad-core 32-bit DSP processor, the AVR-X2200W easily handles multi-thread processing tasks, including Dolby Atmos and DTS:X decoding, Audyssey room acoustic correction, bass management and DSP surround simulation. The processor features tremendous processing power, with 4 300-MHz DSP cores that deliver over 1 billion computations per second. Equipped with 8 HDMI inputs, including 1 conveniently located on the front panel, along with dual HDMI outputs, the AVR-X2200W incorporates an advanced video processor that features support for 4K Ultra HD 60 Hz full rate video, 4:4:4 Pure Color sub-sampling and 21:9 video pass-through, along with support for 3D content. The AVR-X2200W also features HDCP 2.2 compatibility, a requirement for 4K Ultra HD copy-protected content. And, the video processor can also upscale SD and HD video to 4K UHD. Certified by the Imaging Science Foundation, the AVR-X2200W features a full suite of video calibration controls (for use by an ISF technician), along with ISF Day and ISF Night video modes. In addition to handling 4K Ultra HD 3840x2160 resolution, the AVR-X2200W also features HDR (High Dynamic Range) and Wide Color Gamut compatibility, key components of the BT.2020 4K Ultra HD video specification. Featuring Bluetooth & Wi-Fi wireless streaming connectivity, the AVR-X2200W is equipped with an advanced dual antenna RF transceiver system for robust and error-free streaming, even in congested RF environments. Connect to the internet through your home Wi-Fi network (or with a hard-wired connection via the RJ-45 Ethernet LAN port) and enjoy your favorite tracks from streaming music services such as Pandora, Spotify Connect and SiriusXM. You can also choose from thousands of internet radio stations around the world, and enjoy music from virtually every genre. With AirPlay, you can enjoy listing to your favorite tracks wirelessly from your favorite iOS device, including the iPod touch, iPhone and iPad, and the AVR-X2200W is also DLNA 1.5 certified for compatibility with your home PC or Mac. 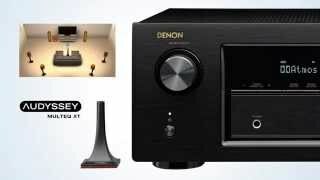 The Denon 2016 AVR Remote App lets you easily control the AVR-X2200W with your favorite portable device and it's available for iOS, Android, and Kindle devices. Featuring high current discrete power output devices on all channels, the AVR-X2200W is rated at 95 watts per channel (8 ohms, 20 Hz~20 kHz, .08% THD). For compatibility with the widest range of loudspeaker models, the AVR-X2200W is also equipped with low impedance drive capability, to provide operational stability with speakers rated at 4 ohms. Featuring dual subwoofer outputs, the AVR-X2200W lets you connect two smaller subwoofers instead of a single larger sub, and enjoy the benefits of response averaging by having two subs in different locations in the room. With dual subwoofers, deep bass is smoother and more detailed, minimizing the peaks and dips that often result with a single subwoofer setup. As the first A/V receiver manufacturer to embrace Audyssey's advanced DSP audio algorithms, Denon has introduced the most Audyssey-equipped products, and the AVR-X2200W features the Audyssey Silver suite of DSP functions, which includes MultEQ XT, Dynamic EQ and Dynamic Volume. You can also connect a USB drive or NAS device and listen to MP3 and WAV files, and the AVR-X2200W features high resolution audio file compatibility, including DSD (2.8 MHz) and FLAC lossless decoding. Denon's acclaimed HEOS whole home audio system features advanced multi-room, multi-source audio streaming, and the AVR-X2200W features IP control capability with the HEOS Link, so you can control the receiver with the HEOS app. As part of Denon's IN·Command series of custom integration friendly A/V components, the AVR-X2200W is equipped with a range of features that provide enhanced control capabilities and compatibility with 3rd party and custom integration solutions. For remote control compatibility with other components in your home theater system, the AVR-X2200W features an IR (infrared) remote control input and remote control output on the rear panel. The AVR-X2200W can also be set up and operated by a home computer on the network via IP control, either via wired LAN connection or via Wi-Fi wireless connection. For direct connection to external home automation and control equipment, the AVR-X2200W is equipped with an RS-232C serial port. The AVR-X2200W also features Control4 SDDP (Simple Device Detection Protocol) certification for quick and easy integration with Control4 home automation equipment. Rated 4 out of 5 by kumbor1959 from very easy to set up and use I found it easy to set up this av system and it is very easy to use .I am still waiting for the DTS-X upgrade even though i bought it over 9 months i cant understand why the delay as the have upgrades for other models released a few months now.i would have also liked to have more speaker binding posts rather than so many hdmi connections on this av receiver.